The John W. Nason Garden is known for its great textural qualities and year-round appeal. Walking through the space this time of year it’s hard to miss the striking Opuntia humifusa in full bloom. 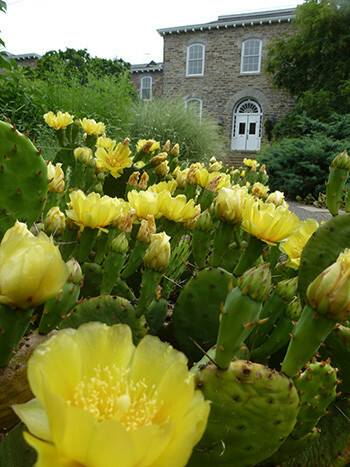 The electric gold yellow flowers of the prickly pear cactus are eye catching, drawing one towards the path they border as ground cover. More species of the Cactaceae family can be found in front of the Science Center. The plant consists of segments made up of one to three pads or stems. Flowers are located along the edges of mature segments. Typically the bloom occurs in early summer, attracting hummingbirds and bees. Interestingly the flowers are diurnal, only lasting one day. The finished bloom is replaced by bright red fruit. It is a native plant and the most widespread of cacti in the Eastern United States. The scarlet red flowers of Monarda didyma can be seen almost floating above the surrounding vegetation as one approaches the Pollinator Garden. The tubular flowers last from June to August attracting bumblebees, butterflies, and hummingbirds. This specific cultivar, ‘Jacob Cline’, was discovered along the Blue Ridge Parkway in Georgia by garden designer Jean Cline and named for his son. It has a reputation for being more mildew resistant than other species of Monarda. Avoid overcrowding to further ensure air circulation throughout the plant. Stems can also be thinned and foliage can be cut back after flowering. Tucked away in the Theresa Lang Garden of Fragrance, Daphne x burkwoodii, can be found in the most eastern bed. The delicate white edging of the foliage stands out against surrounding plants. While this shrub produces lovely light pink flowers in late spring and has interesting red drupes in fall, the variegated leaves alone are noteworthy. It is semi-evergreen as the leaves stay often through December. The gradient of green to yellow-green between the variegated margins of the leaves creates a sense of depth and buoyancy to the entire shrub. Thanks Becky. Lucy did a great job this week.